This page provides step-by-step instructions for creating the rigid body based skeleton markersets in Motive. 3.5 Step 5: Set skeleton name. 3.6 Step 6: Create Rigid Body Skeleton. 6 Rigid Body Skeleton in Motive. 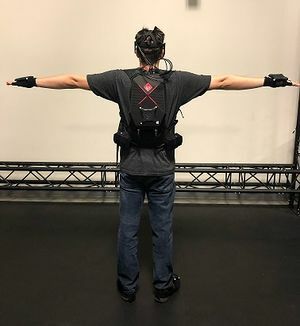 4 Rigid Body Skeleton is used for upper body tracking only, and 6 Rigid Body Skeleton is used for the entire full-body skeleton tracking. 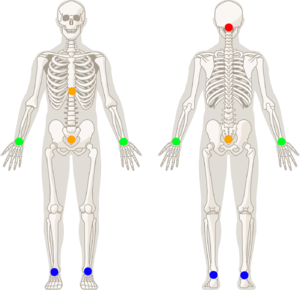 For the 6 Rigid Body Skeleton, two additional rigid bodies are attached to both feet, but the basic insturctions for creating the skeleton is the same. You can use either the passive retro-reflective markers or the active pucks to produce the rigid body skeleton. This is needed only for the 6 Rigid Body skeleton markerset. Let's first start with defining a rigid body for the chest rigid body. Open up the Builder pane, make sure the Rigid Bodies option is selected at the bottom, and access the Create tab. This will bring up options for defining rigid bodies in Motive. 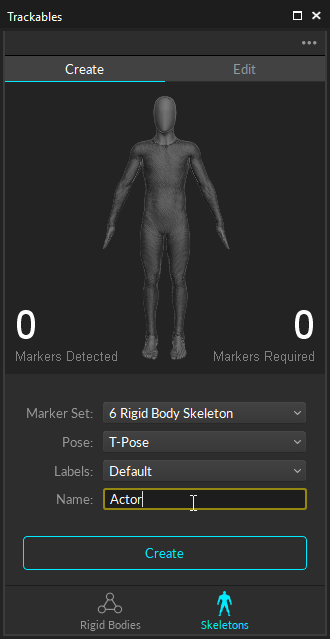 In the 3D viewport, select all of the markers on the chest rigid body, and you should be able to see the selected markers in the Builder pane. 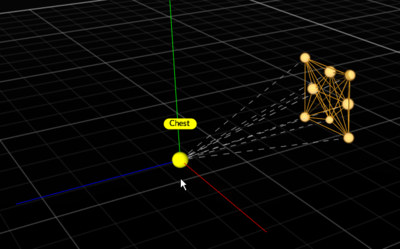 Name the rigid body as Chest, and click create. If you are attaching the rigid body on the lower back, you will name the rigid body Hip instead. Only either one of the Chest or the Hip rigid body is needed for the 6 rigid body skeleton. Once the chest or hip rigid body has been created, the next step is to position and orient its pivot point at the appropriate location. You can use the Gizmo tool to easily translate the rigid body pivot points. For the chest rigid body, the pivot point must be placed at the center of the torso, approximately at the heart center; which is in between the spine and the bottom end of the sternum. For the hip rigid body, the pivot point must be placed at the center of the hip bone. 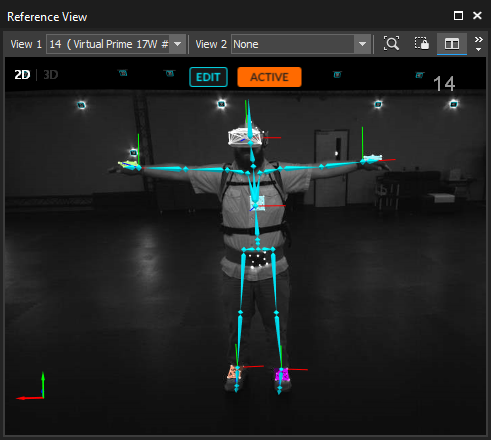 This is easier to set up by switching one of the cameras to a grayscale video mode and using the Reference View pane to monitor where the pivot point is placed within the actor's body. After positioning the pivot point, adjust the orientation of the rigid body pivot also by using the rotate Gizmo tool. 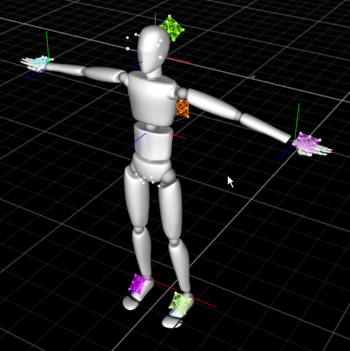 For creating 6 Rigid Body skeleton, the +z axis must direct towards the front of the actor. Enabling the Orientation setting under the rigid body properties will reveal the orientation of the selected rigid body. Now that the chest, or hip, rigid body has been set up, next step is to create a rigid body for the head. This can be either the active CV1 clip or an rigid body attached to the head. Only one of them needs to be created. 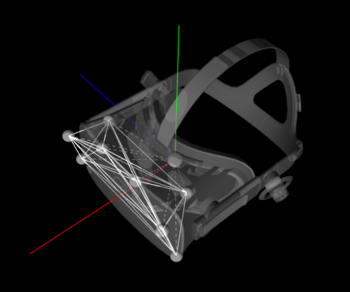 For HMDs using the active CV1 clip, you can use the HMD tool in the Builder pane to easily create a rigid body. Make sure to choose either the +Z-forward or the +X-forward orientation, and the rigid body must be named HMDHead for +Z-forward orientation or HMDHeadX for +X-forward orientation. Under the Orientation drop-down menu, select the desired orientation of the HMD. Name the rigid body as HMDHead for +Z-forward orientation or HMDHeadX for +X-forward orientation. The process of creating a head rigid body is similar to the steps for creating the Chest rigid body. You can use the Builder pane to define a rigid body named Head. Once the rigid body is defined, use the Gizmo tool to translate the pivot point to at the center of the actor's head near the neck joint. Then, likewise, orient the rigid body so that +z axis is directing towards the front. Step 5: Set skeleton name. Now that the head and torso rigid body has been prepared, we can start defining the skeleton. 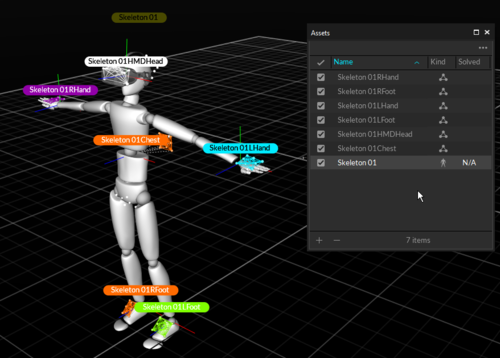 Open the Builder pane and select desired Rigid Body Skeleton from the marker set drop-down menu, and assign a name for the skeleton that will be created. Step 6: Create Rigid Body Skeleton. Ask the subject to strike a calibration pose (e.g. T-Pose). Then select the two rigid bodies and press Create on the Builder pane. 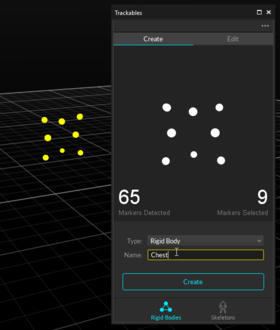 This action will automatically define rigid bodies for the remaining rigid bodies on the hand/foot, and also place the pivot points at the proper location automatically. All of the rigid bodies will have the prefix with the name given to the skeleton (see screenshot below), and the skeleton will be created and tracked. In order for the rigid body skeleton to work, it is important that all of the rigid bodies have name prefix that matches the skeleton name. If one of the rigid body doesn't seem to be contributing to the skeleton solve, please check these names. 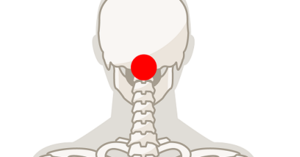 Pivot Point Locations: Pivot: Head (when HMD is not used). Pivot: Left and Right Hand, Pivot: Left and Right Foot, Pivot: Hip (or replaced by Chest rigid body). After the skeleton has been created, confirm tracking of the skeleton. If any of the skeleton segment seems to be misaligned, double-check the position of the attached rigid bodies and corresponding pivot points. 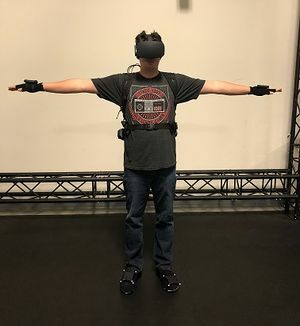 Chest RB Pivot: When using the Chest rigid body for the torso-tracking. The length of the abdomen segment gets solved by referencing the location of the chest rigid body pivot point. If the created skeleton has an abnormally long or short abdomen segment, double-check and adjust the height of the chest pivot point. Neck: If the pivot orientation of the Chest rigid body doesn't align with the head rigid body, the neck of the created skeleton is may appear to be bent. Make sure the chest rigid body's y-axis is pointed directly up towards the Head/HMD rigid body pivot. A: If the head or HMD is facing backward or sideways, it indicates that it's orientation is not properly set. Please double check the position/orientation of the rigid body head to make sure they are set properly. A: When this happens, double check the orientation of each rigid body. 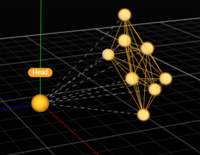 All rigid body must be named properly and their z-axis must be facing the forward direction. A: When this happens, it indicates that the position of the HMD (or head) and the Chest (or hip) rigid body is not accurately placed. The 6 rigid body skeleton gets calculated from pivot points of these two rigid bodies, so if there is an obvious misalignment of the created skeleton bones, double-check and make sure these two pivot points are set up properly. This page was last modified on 22 January 2019, at 14:39.